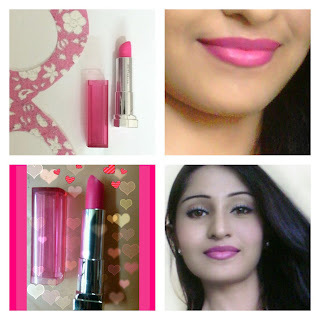 Show me a girl who does not love Pink, I too love pink and have been craving for some gorgeous and bright pink lip colors this monsoon, and that’s the reason I picked this amazing shade from Maybelline’s Pink Alert range – POW 2.I am quite sure whosoever holds this lipstick or add this to their vanity kit can be sure of the fact that this lipstick is gonna boost the mood. • Amp up your lips in the hottest pink. 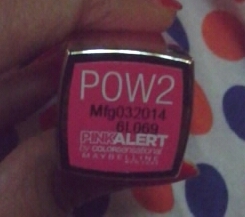 Packaging : The Maybelline Pink alert Lipsticks comes in a pink translucent packaging with a plastic cover mentioning PINK ALERT. The shade name is mentioned at the bottom on a color coded sticker. The cap shuts tightly and would not open up in your handbag. The cap of the lipstick is pink! And did I mention before that if there’s something in pink, there’s no chance I won’t like it!! The packaging inside is pretty typical, like the other Maybelline Color Sensational lipsticks. Creamy and buttery texture which glides on like a dream.